My friend Lisa brought treats to a church activity recently. She is a wiz in the kitchen, so I wasn't surprised to find out that the most amazing homemade caramel sauce I have ever tasted was hers. She told me how easy it was and shared her recipe...and said I can share it with you! Hooray! 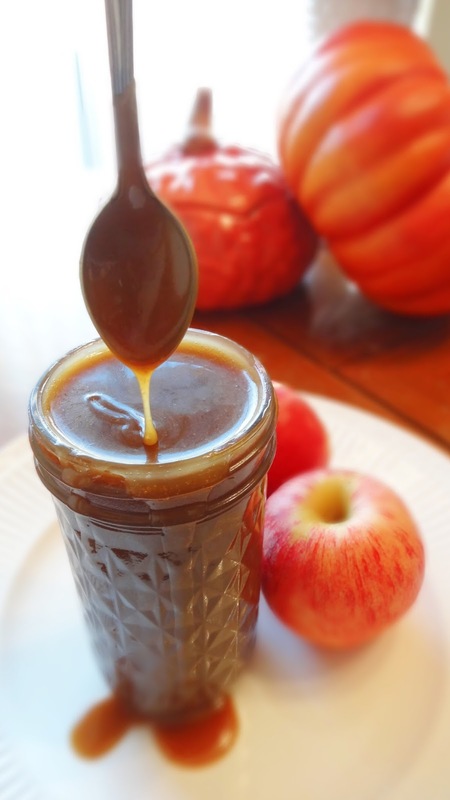 So to kick off my fall baking, this Homemade Caramel Sauce seemed like the perfect thing. It's something simple that you can add to pretty much any of your other fall baking to make it even more amazing. Think of the possibilities! I digress...it's easy to get distracted here, thinking about caramel. However, you can't do any of this without the caramel sauce first! And so, on to the recipe! In a medium saucepan, melt the butter over medium to medium-low heat. Stir in the sugar and cook, stirring constantly, for 2 minutes. Add in the whipping cream and cook another 2 minutes. The mixture will have some nice slow bubbles going. If it starts bubbling up and getting too frothy, turn the heat down.